I grew up going to a regional wholesale store with my mother on the weekends. I recall the store’s slimy hot dogs and burnt pretzels that made my stomach churn. On top of that, the smell was always rank. The only way I can describe it is as a cross between cardboard, stale soda pop and sweat. When I first heard the buzz around IKEA toying with the idea of making stand-alone cafes, I couldn’t quite wrap my head around it. Maybe I’m a bit pompous when it comes to food, but something about eating at a retail store turns me off. No thanks. Since the Swedish store’s opening in 1958, it has expanded into multiple countries including the U.S., Italy, France, the U.K., Japan, Russia and more. The store itself has been open for decades, and the IKEA food phenomenon is nothing new, either. The first IKEA restaurant opened in 1960. Since then, its dining concept has grown to produce monumental sales. FastCompany reports that IKEA Food had a whopping $1.5 billion in sales in 2013. People all over the world have been enjoying the famous IKEA meatballs, lingonberry sauce, perfectly prepared salmon and more for longer than I’ve been alive. The more I learned about the food’s popularity (“You mean, some people go there to just eat? They don’t even shop?”), the more I began to feel like a big loser for never eating at IKEA. A quick search on Instagram made it hit home for me. I typed in #ikeafood, and the more than 54,000 results were somewhat mind-bending. For example, I saw a post from a family that took its dad to IKEA for his Father’s Day lunch. They chose it because it was their “fav” place to eat. I made my dad a grilled cheese (without the crust). Then, I saw a post showing off a masterpiece spread: fried fish, a colorful salad, meatballs, waffles, sausage, hash browns, french fries… and more. The accompanying text read, “Saturday breakfast.” You know, because Saturdays are meant for leisurely strolls around IKEA and eating food that looks straight out of Julia Child’s kitchen afterward. Maybe I was out of touch when it came to IKEA’s food. Maybe. In all fairness, I’m not the only person in this universe who thinks eating inside a store is a little… strange. My co-worker, email marketing specialist Colleen Rice, admitted to having “always” feared IKEA’s food. When I asked her exactly what about it scared her, I found her mindset was the same as mine. One of my other co-workers, though, is passionate about IKEA food. Sharon Steinmann, director of photography, swore to me the food was top notch. When I told her about my childhood nightmares of disgusting warehouse food, she insisted IKEA was different. She and her family make it their No. 1 choice for Sunday dinners, and it’s the only place that serves a meal her 22-month-old son, Ezra, will consistently eat. She also told me it was dirt cheap. If I could (supposedly) eat like royalty for an insanely low price, did it matter that I was dining in the corner of a giant warehouse store? Is IKEA Food Worth the Hype? As I entered the cafe midafternoon on a Friday, it was packed. There were old people, young people, entire families and even single diners all huddled over their trays or sipping coffee. Some chatted while others smiled and stared out the floor-length windows. I peeked at their food, and it looked appetizing. So, I grabbed a tray and started my way down the food line. I opted for veggie balls (I’m a picky eater) topped with a Thai coconut curry sauce, and served with fresh steamed vegetables and rice. Oh, I also got a drink and dessert. I was shocked when I got to the cashier and it only cost $7.99 with tax. I sat down and took a look at my food. It looked more than edible — it looked delicious. And it smelled good, too. My plate was a far cry from my childhood nightmares of our local wholesale store. IKEA’s food tastes amazing. The cuisine isn’t limited to strictly Swedish fare. If you’re not into salmon, some options include chicken tenders or pasta. Who doesn’t love pasta? Not only is IKEA’s food delicious, but it’s inexpensive. I ate an entire meal for less than $8, and entire families eat for under $20. Steinmann spent just $18.99 to feed herself, her husband and their son. Since they’re IKEA Family members, they got free cappuccinos, too. Eating at IKEA isn’t weird. 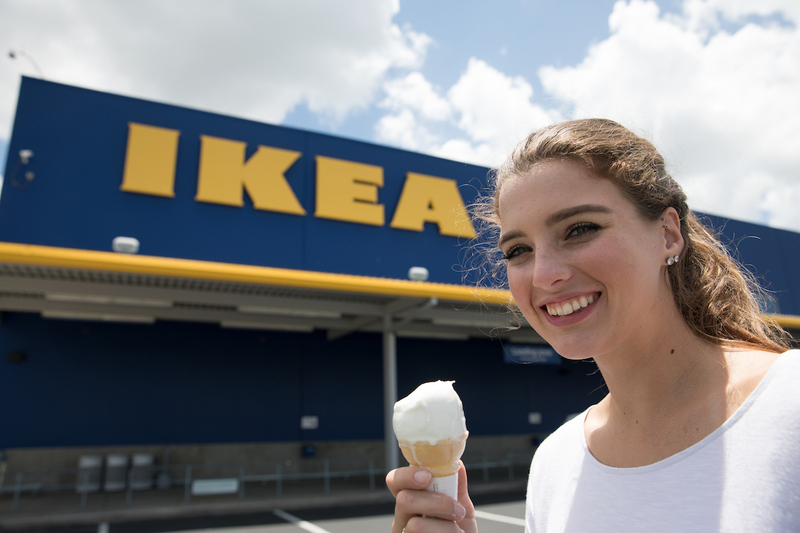 There’s so much more than hot dogs and pretzels, though IKEA serves both downstairs. This is real, sustainable food. IKEA pledges to serve “food you can trust” and requires its supplies to have special quality programs in place. To maintain quality, IKEA hires independent agencies to perform surprise audits on its suppliers. It also makes sense to me why so many other people dine there. There are kid-friendly areas throughout the cafe, and there’s also the IKEA Family loyalty program, which is free to join. As an IKEA Family member, you’re eligible for product discounts, price guarantees, free coffee, occasional free meals for kids and more. Looks like I’ve turned over a new leaf. I see plenty of IKEA meals in my future. And no, IKEA didn’t pay me to write this post.